Traditional trade show marketing feels a lot like a billboard placement or a radio spot. The amount of exposure and impressions are impressive, but the cost-per-lead and return-on-investment can be unpredictable, vary widely, and often disappoint -- unlike the tech-powered and data-driven marketing of today. Yet, the opportunity at trade shows to showcase new products and technologies, network face-to-face, understand competitor strategies, and learn what’s new in the industry is unmatched -- and unfailing. According to Statista forecasts, trade show attendance, value, and revenue are all projected to grow, as trade shows continue to be one of the most profitable B2B marketing strategies. We’ve seen it ourselves as regular attendees of the NAHB International Builders' Show, where attendance has grown from more than 65,000 registrants in 2016 and 2017, to over 85,000 in 2018. So how can you make sure your trade show tactics support your B2B lead generation goals? Here are several key trade show marketing ideas that increase and prove trade show ROI. Design a goal-oriented, data-driven plan. Before attending the show, set clear key performance indicators (KPIs) to justify the expense of exhibiting or attending, and attach numbers to them. How many contacts do you intend to capture? How many stalled leads do you intend to catalyze into movement through the sales funnel, and what’s the approach? How will you track interactions? Ensure a system is in place to capture contact information and qualify prospects. Set KPIs that keep your team accountable for securing interactions, whether they be a number of contacts, conversations, or dinners hosted, so you can more accurately track the success of your efforts. Get to know the audience in advance. From checking in with clients who may be in attendance, to media and PR list outreach, to reviewing competitors who are confirmed exhibitors, understand who will be attending and how your team will approach each audience. Determine who your organization needs to talk to, and consider reaching out beforehand to schedule media interviews and prospect appointments, and develop scripts or lead-ins for each audience. Don’t rule out prospective leads that aren’t attending -- use their declination as an opportunity to let them know what they’ll miss that’s relevant to their industry. Conduct outreach before, during, and after. An email marketing campaign that includes deployments before, during, and after the show will keep you top of mind with audiences. Start the conversation and generate excitement by sending a teaser email in advance of the trade show hinting at what you’ll be unveiling, what audiences can expect, and where you’ll be located. During the show, sending a reminder email with an incentive to stop by your booth will catch your prospects’ attention. After, beat competition by responding promptly with a personalized message tailored to the needs conveyed during each contact’s interaction. Make your call-to-action specific as a way of further gauging lead quality. Emphasize connection -- and measure it. There’s no better way to stay relevant with buyers than by forging connections face-to-face and nurturing leads in person. Your team of core marketing and sales professionals who will attend the trade show are essentially brand ambassadors -- make sure they’re genuine, personable, and skilled at pushing the needle from warm to hot. This means more than simply scanning an attendee’s badge and keeping the booth sufficiently staffed. In an era where technology is replacing face-to-face engagement, forging meaningful connections is paramount. Determine protocol for how you will draw attendees into your exhibit, start conversations, take notes, and keep the dialogue going -- and attach quotas and qualifiers. Be memorable by offering something new, or creating an experience. With hundreds of booths and brands exhibiting, it’s easy to get lost in the crowd. Make sure your brand’s booth becomes more than a blur by offering something more visually memorable than flashy or noisy. Or, use the show as an opportunity to launch a new product or showcase new technology. Product demonstrations are a great start, but make it an objective to involve floor traffic to increase interactivity and engagement. Host a unique event in tandem with the show that fills a gap in scheduling and keeps the energy up. Make sure it relates to your brand’s story and creates shareable moments worthy of social propagation. Looking for more trade show marketing ideas and help with B2B lead generation? 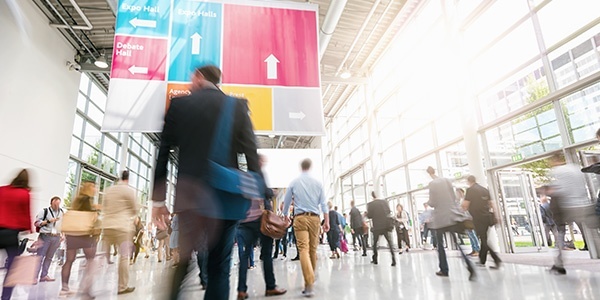 Here’s how to create customer engagement at a trade show if you’re simply attending, how to make the most of next year’s IBS, and our picks of past exhibitors who’ve done it right. Or, contact us to develop a B2B lead generation program for your next trade show.